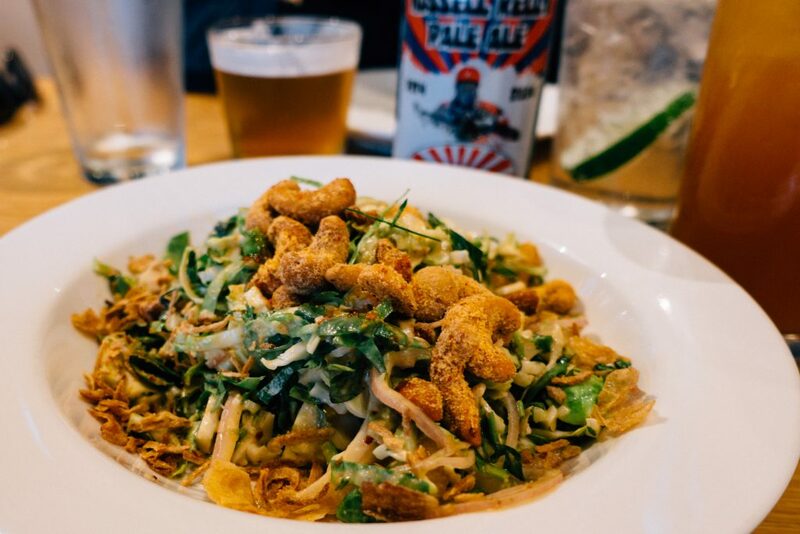 As you may be aware, I love ramen and I’m on the hunt for the Best Ramen in Denver. 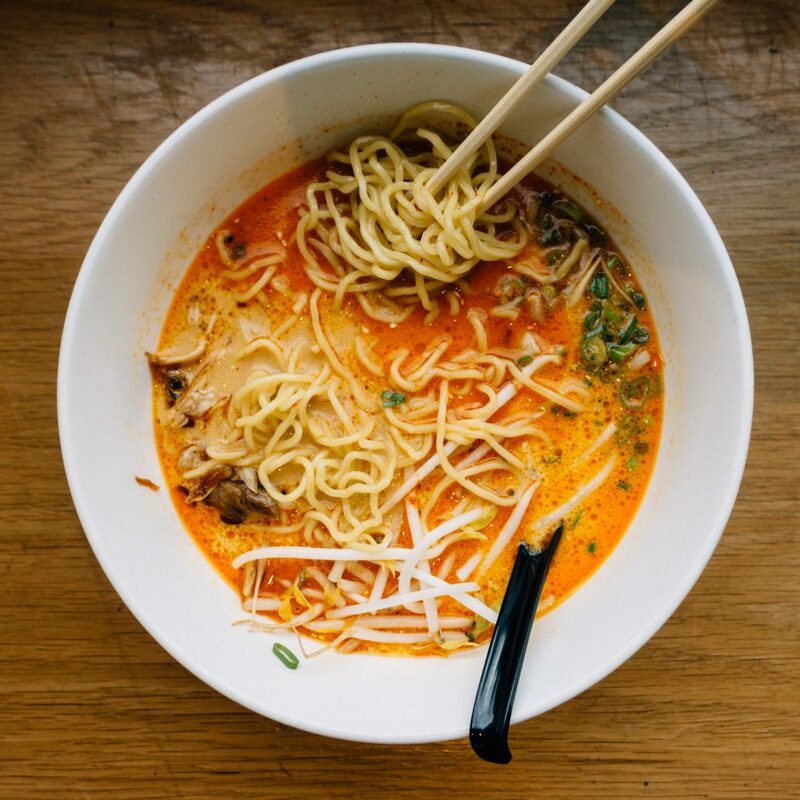 Some of my absolute favorite ramen places in the world are in my hometown of New York City, but I’m determined to find the number one spot in Denver that might rival some of the great bowls of noodles I’ve had at Mew Men and Ivan Ramen. 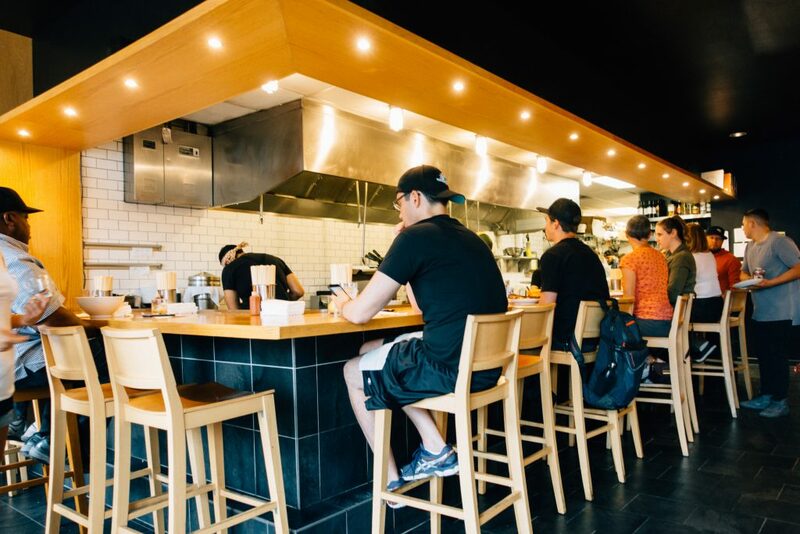 The first stop on that quest is Uncle, one of the most highly rated ramen joints in the Mile High City. 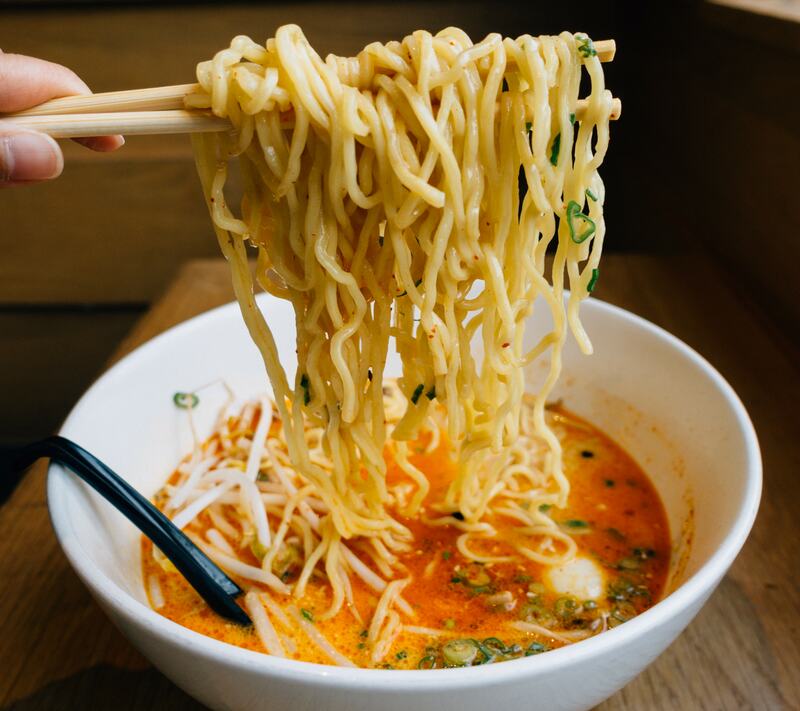 When you step into Uncle you may be struck hard by a case of deja vu if you’ve ever eaten at Momofuku Noodle Bar in the East Village, NYC. As others have mentioned, Uncle has an eerily similar look and layout, from the glass panel-encased entrance to the boxy, blonde wood bar seating facing the kitchen to the left paired with long tables with short stools to the right, this ramen joint is heavily cribbing off of the ramen house look made famous by David Chang’s game-changing restaurant. We started with something light to warm up our taste buds, choosing the Radicchio Salad ($9). A plate of shaved radicchio topped off with bits of coconut, shallot, lemongrass, green papaya, and spicy cashews, this salad had a lot of flavor going on. Although my husband liked the salad, I felt like it was a bit too much for me (maybe a bit too much dressing for my liking) and would probably try another appetizer like the edamame on my next visit. I also ordered off the non-alcoholic drink menu, getting the Yuzu Palmer ($4), which had a nice, unique tangy taste. My husband got the Veggie ramen, which is vegan-friendly, made with a miso broth, mushrooms, arugula, scallion, and soft egg ($14). Much more on the lighter side in terms of broth flavor profile. I particularly liked the mushrooms, which were meaty and delicious. I ordered what I had heard to be the most popular item on the menu — the Spicy Chicken ramen, which is made with a spicy sesame broth, bean sprouts, scallion, and soft egg (also $14). The broth had a good complex, deep flavor, with a medium spice level and looked beautiful with a bit of a fiery orange color. Noodles were very good – springy with a substantial bite. Egg was perfectly runny when poked and the sprouts and scallions bright and crunchy. Although this bowl did not top my most favorite ramen in NYC, I feel that it could definitely hold its own if it were served in the Big Apple. So far this ramen hunt is off to an auspicious start! Pro tip: If you’re like me and can’t finish your bowl and take the rest to go, be sure to get a side order of noodles for your leftovers! 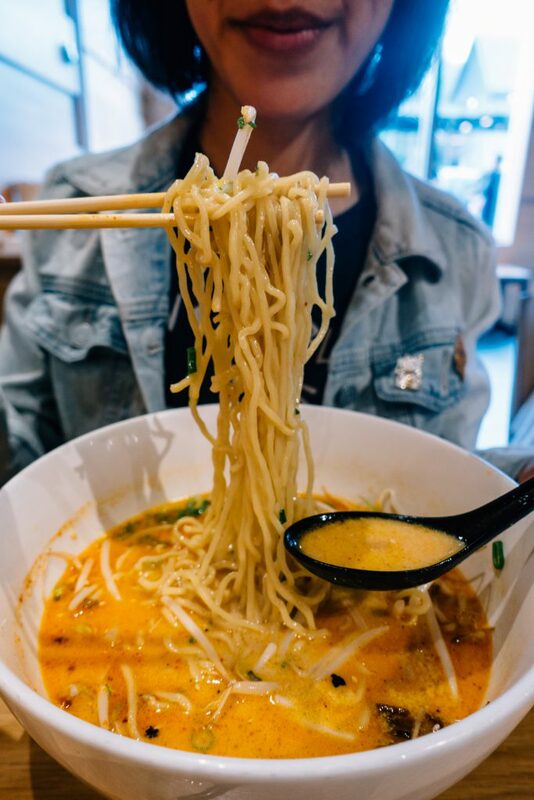 Will take a few minutes so make sure you order in advance of when you want to leave, but this extra batch of noodles will stretch your meal into two!